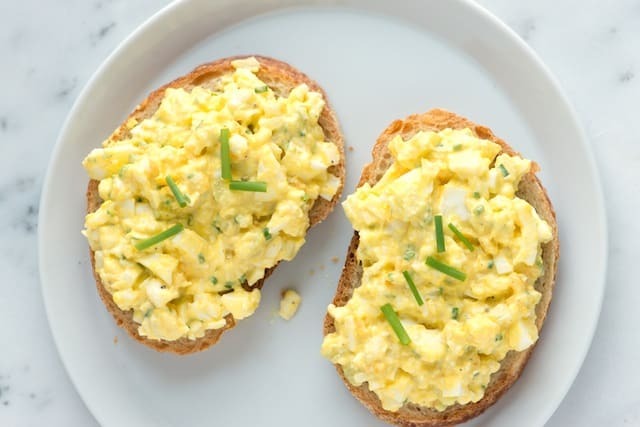 I will be taking a little detour from the produce of the day challenge to share one of my favorite recipes that I made up this summer, egg salad. Usually egg salad is made with mayonnaise, which makes it not so healthy. My recipe calls for plain greek yogurt instead. Plain greek yogurt is a staple in my house. I use it in smoothies, replacements for butter in baking, substitute for sour cream, and just as is with fruit. In a bowl deshell the eggs. Cut into 1/2 inch pieces and place in a separate bowl. Add yogurt, mustard, scallion, salt, and pepper and combine. Serve on ezekiel bread, lettuce wraps, with beanito chips, or eat by itself! Eggs are a great source of protein (from the egg whites) and have few calories. They are high in vitamin D, B12, B2, and B6. A lot of people refrain from eating the yolk, but it actually contains good fats. Don’t be afraid to eat eggs…an egg a day may keep the doctor away! Yum! I cut up a fresh pineapple yesterday and let me tell you, I have never had a pineapple taste that sweet and delicious! Slice your pineapple into 2 inch thick strips. Brush each strip with olive oil. Place on a heated grill for about 6-8 minutes each side (until charred nicely). By grilling the fruit, the sugars are brought to life (enhancing the flavor) and ends up caramelizing the pineapple. YuMmY! Arrange your skewers with shrimp, pineapple and vegetables. Make the glaze by whisking honey, vinegar, liquid amino acids, and garlic together. Place skewers on a heated grill until shrimp turn opaque (2 minutes). Brush on the glaze and flip the skewers. Brush again with the glaze and take off the grill. Serve with quinoa or brown rice. In a food processor combine pineapple and banana. Slowly add the coconut milk to get it to a smoother texture. Serve immediately. (Found on pinterest). Peaches are a summer favorite, especially when you get that perfect, juicy, sweet bite! Peaches are at their peak from June to the end of August (yay all Summer). These fuzzy fruits are actually a part of the rose family…interesting right? They are rich in vitamin A and C. Not to mention, they taste like candy! Mix all together, and enjoy with Beanito chips, by itself, or as a topping! Combine all ingredients and toss in the dressing. Sprinkle each half with a tbsp. of sugar. Sprinkle each half with cinnamon. Place under broiler for 5-7 minutes (until sugar caramelizes). Top with nice cream. 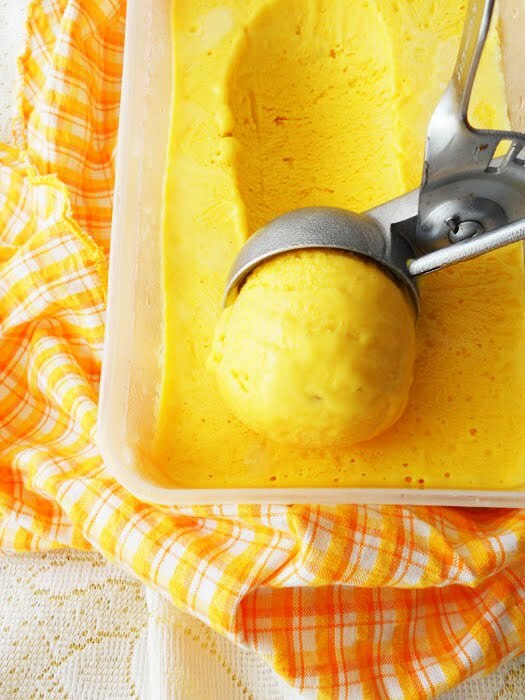 In a food processor blend the ingredients until consistency of ice cream. Serve immediately, or freeze until ready to eat. Produce of the day #6 is bell pepper! I am growing some in my backyard and am thrilled at the turnout! Bell peppers are full of vitamins and minerals, however, the red bell peppers contain the most. They have more vitamin C than oranges, crazy right? If you’ve never had a bell pepper, they are not hot/spicy at all, in fact they have a sweet burst of flavor. Pre-heat oven to 425 degrees. In a skillet, brown the meat and red onion in olive oil while stirring in the cumin, salt, pepper, and chili powder. Pour the salsa, corn, and beans in with the meat and heat. Cut the peppers in half and lay in a shallow baking dish, cut side down. Bake for 15 minutes, or until skin bubbles. Fill the bell peppers with the mixture, cover with foil, and bake for another 15 minutes at 400 degrees. 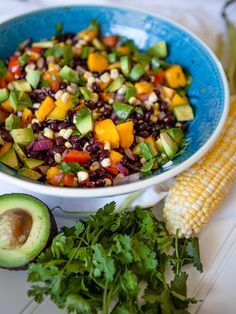 top with avocado and cilantro. Serve. Slice the bell pepper into thin rounds. In a medium heated skillet, add part of the olive oil and place enough bell pepper rounds to fill the skillet. Crack an egg in each round. Season with salt and pepper. Allow to cook for 3-5 (soft egg) or 5-9 (hard egg) minutes. Cook all the bell peppers and eggs. Serve. In a bowl whisk honey, garlic, olive oil, vinegar, and salt/pepper. Pour 1/4 into a separate bowl. With the remaining 3/4 of the mixture, add all the vegetables and meat. Place in a plastic bag and let sit for at least an hour. Drain the marinade from the bag, and trash. 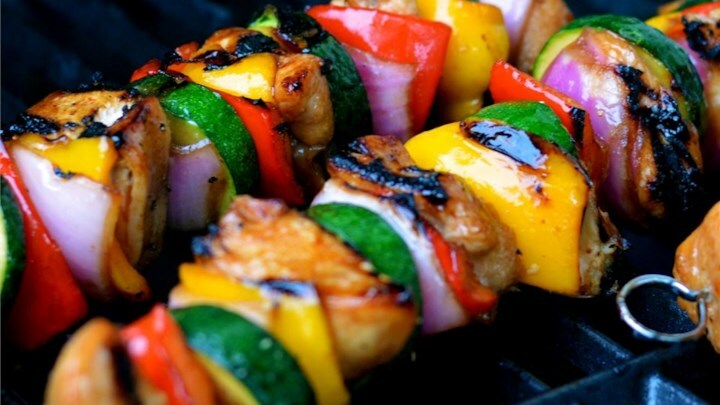 Arrange the meat and veggies on the skewers in a pattern. On a high heated grill, place the skewers on for about 12-15 minutes. Brush with remaining marinade. Serve. Day 5 in the summer produce challenge, are you keeping up? Mango! This fruit can be used in many different ways. It has such a sweet flavor that is especially good in the summer. It is also helpful in aiding with digestion, boosting the immune system, lowers cholesterol, and contains vitamins/minerals to clear up skin! Get your hands on some mango! Peel and deseed the mango. In a blender, combine 1 1/2 mangos, spinach, almond milk, yogurt, and honey. Add ice and blend until smooth. 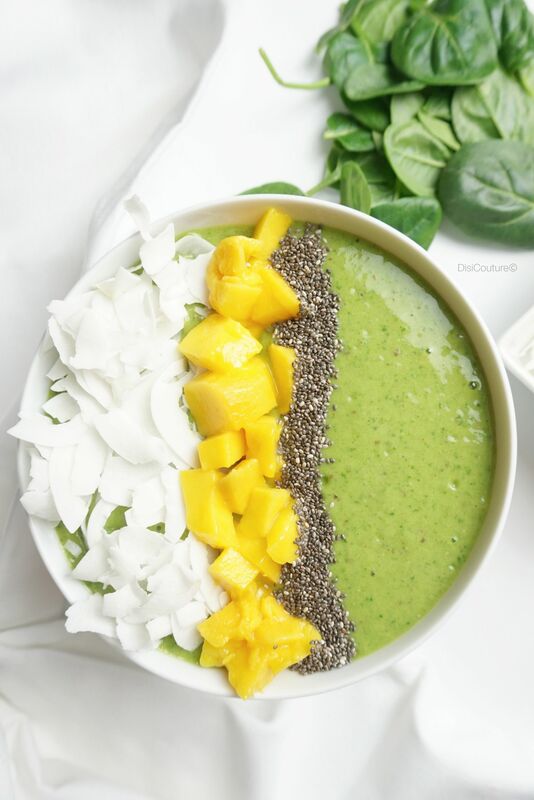 Pour into a bowl (or 2) and top with chia seeds, coconut and other 1/2 of the mango, diced. In a large skillet or pot, saute the onion with olive oil (2 minutes). Add the poblano pepper and saute for another minute. Add tomatoes, beans, corn, mango, and cooked quinoa (or rice). 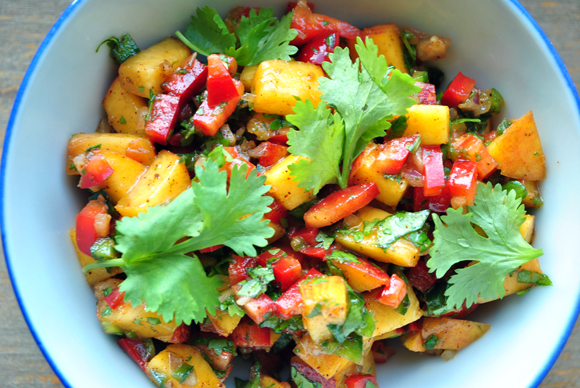 Cook for about 10 minutes (add cilantro after 5 minutes). Serve in bowls, top with avocado, lime juice, a dollop of yogurt and cilantro. You can eat alone or with beanito chips! In a food processor blend mango, coconut milk and honey. Put in an airtight container and freeze (at least 20 minutes). Serve into bowls and top with raspberries. Two in one day? Yes! I had no time yesterday to post because of my new job (blog post to come on that). This is by far my FAVORITE summertime produce…watermelon!! Every year I look forward to sitting out by the pool with a big bowl of cold, juicy, sweet watermelon! Like cucumbers, watermelon has a high water content which will keep you hydrated in the summer heat. It is also loaded with vitamins and minerals, reduces inflammation, body fat and supports overall health! Cut the watermelon into cubes, or use an ice cream scoop to make round balls out of the watermelon. Place the watermelon in the plastic bag and freeze for a few hours. 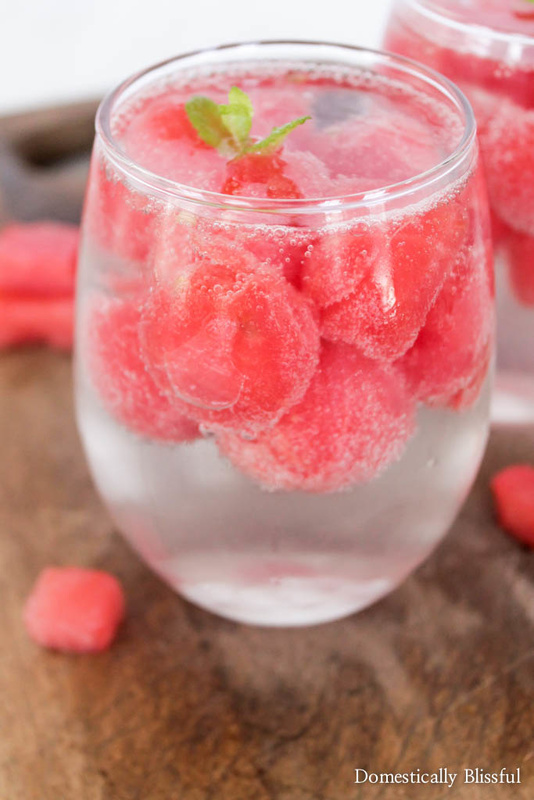 Now you have watermelon ice to add to water! Quarter the watermelon and cut into 2 inch thick pieces. Brush with olive oil and place on a heated grill (2 min each side). Remove the rind and chop the watermelon into bite size pieces. 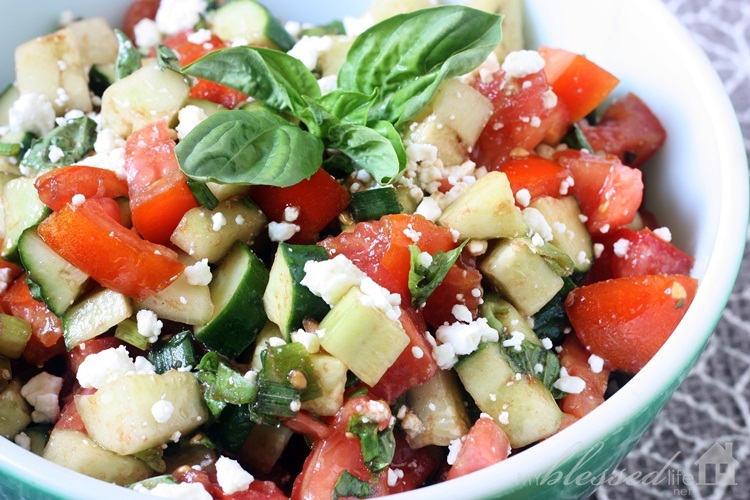 Toss in a bowl with olive oil, sea salt, feta, and basil. Top with balsamic vinegar. Serve! Whisk the honey, lemon, olive oil, salt and pepper together in a large bowl. Add in the arugula and toss thoroughly. Add watermelon, feta, onion, mint and toss lightly. Serve! Day three in the #produceoftheday challenge and we have had a few posts (Thank you, Mindye)! I am hoping we get some more participation! The 3rd produce is one of the most refreshing vegetables to eat during summer, cucumbers! Cucumbers are 95% water therefore keep you hydrated, flushes toxins out, keeps you fuller longer, and is loaded with healing vitamins. They have a fun crunch followed by a refreshing taste that keep you wanting more! Especially in the blazing heat of summer. Take the mint leafs in your hand toll them together, extracting the mint flavors. Combine all ingredients a large pitcher, let sit for 15 minutes to a few hours (refrigerated). Pour into water glasses and enjoy! Combine all of the ingredients and toss in the dressing, serve! Peel or leave of the skin of the cucumber, then slice into quarter of an inch thick circles. Place, evenly separated on a serving tray. Combine the yogurt, dill, salt and pepper in a small bowl. 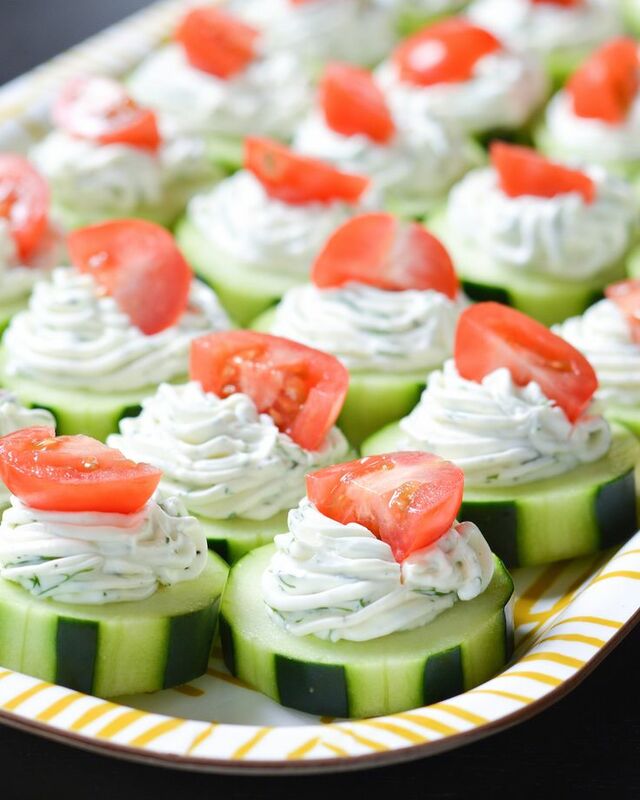 Place a dollop of the spread on each cucumber. Top with a tomato half and enjoy! This is day 2 for the #produceoftheday challenge! I am choosing one of the most eaten fruits year round, strawberries! Majority of people cut them up and add them to cereals, oatmeal, or smoothies. 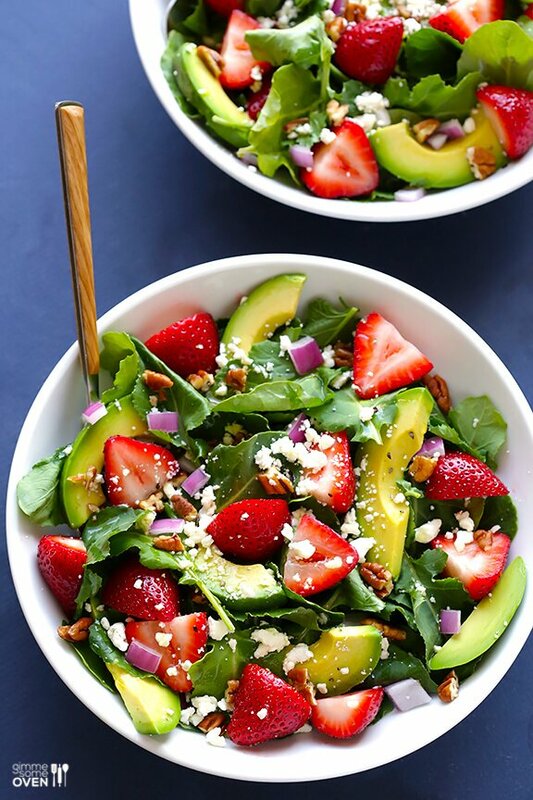 Let’s change it up a bit with these cool recipes with strawberries. Strawberries are full of antioxidants, vitamins and minerals such as magnesium, vitamin C, copper, and omega-3 fatty acids that help with clear skin, hair strength, and weight loss (it produces a metabolism boosting hormone and suppresses appetite). Toss the spinach in the olive oil and vinegar. Then fold in the rest of the ingredients and enjoy! Combine the honey and strawberries in a food processor until combined leaving some chunks of strawberry. 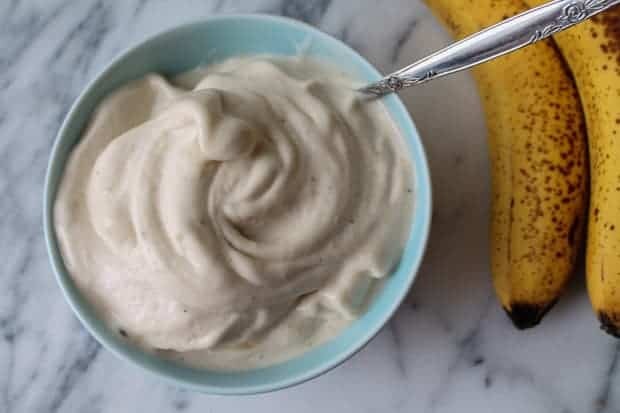 In a bowl combine the fruit puree and yogurt. Pour evenly into the popsicle canister and freeze for at least 2 hours. You can use more than one fruit and layer the popsicles too! Combine all ingredients in a medium saucepan and stir over medium heat. Break apart the fruit as you stir. Keep stirring until the juices from the fruit release and a jam like mixture forms, roughly 10 minutes. Remove from heat and let sit for 1 hour. Pour into jam jars and keep stored for up to 2 weeks! I’m starting off the produce of the day challenge with the vegetable, zucchini. I decided to go with this first because my good friend dropped off a big bag of freshly picked zucchini from his garden! That is the way to my heart! 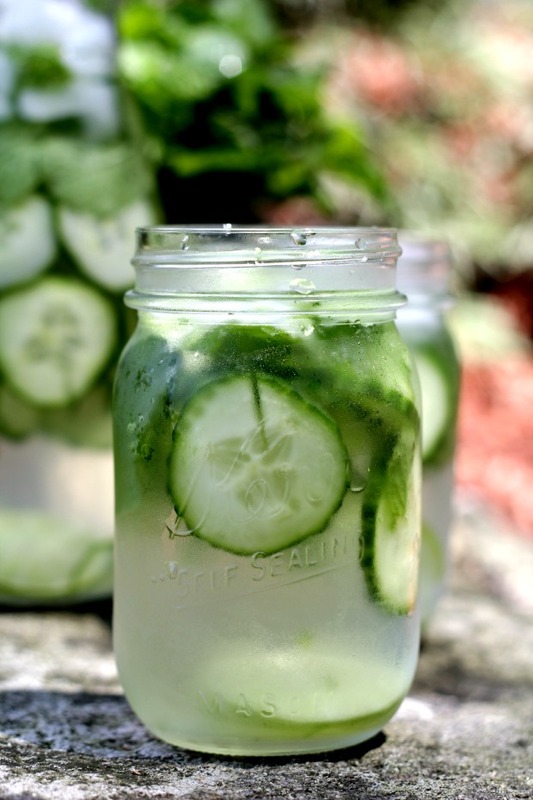 Looking almost exactly like a cucumber but contains less water, zucchini can be used in so many ways! They have very few calories but are packed full of antioxidants, constipation fighting fibers, omega 3-fatty acids (yay good fats), potassium and more. Here are some recipes to incorporate this magical food into your body. Slice the zucchini thin and evenly (works best with a mandolin). Place between two paper towels and cover with a baking sheet. Press down to allow the zucchini to release extra moisture. 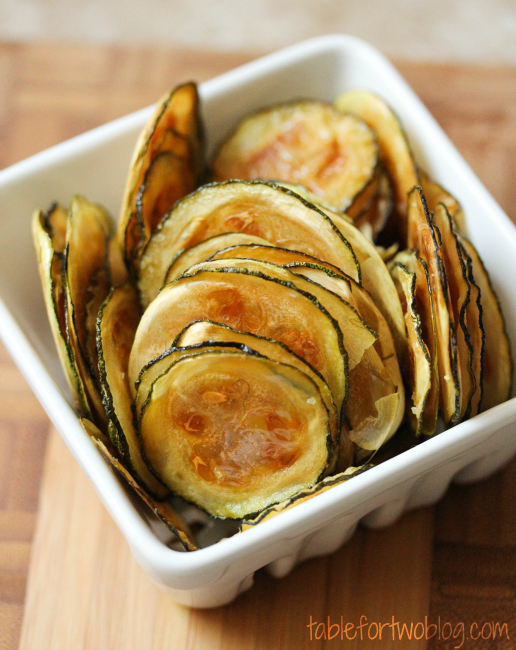 Toss zucchini in a bowl with 1-2 tbsp. olive oil and 1 tsp. salt. Bake for 2 hours. Eat and enjoy this healthy chip! Chop eggplant into bite sized pieces and put into a bowl with 1 tbsp. sea salt. Chop onion, pepper, zucchini and tomatoes into bite sized pieces and place into separate bowls. In a large pot add 1 tbsp. olive oil and saute onions until brown (10 minutes) on medium/high. Add peppers and cook for another 5 minutes until soft. transfer to a clean bowl. Add another tbsp. of oil to the pot and cook zucchini for 5 minutes. Transfer to the onions and peppers bowl. Rinse the egg plant and squeeze to remove moisture. Then place 2 tbsp. of ol=il to the pot and saute for about 10 minutes, until translucent. Add to the vegetable bowl. Saute garlic with another tbsp. of oil and then add tomatoes, bay leaf, and thyme. Add everything back into the pot, bring to a simmer then reduce to low heat. It can sit for 20 minutes to 2 hours. Remove bay leaf and thyme. Add basil and serve! Combine the two flours, cocoa, baking powder, baking soda, salt, and chocolate chips in a large bowl. In a separate bowl, beat the eggs until they become slightly fluffy. Next whisk in the yogurt, honey, coconut sugar, applesauce, and vanilla. Mix until well and then add the grated zucchini. Stir the wet and dry mix until thoroughly combined. Be careful not to overmix. Divide the batter evenly among the 12 muffin cups, filling until they’re about 3/4 of the way full. 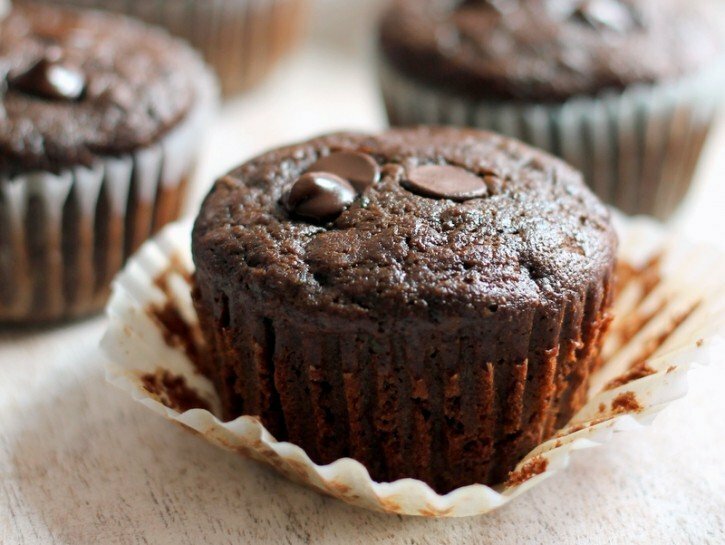 Top with additional chocolate chips, if desired. Bake for 17-19 minutes, or until the tops of the muffins are firm to the touch and a toothpick inserted into the centre comes out clean. Summer is my favorite season for many reasons: swimming, relaxation, extra time for hobbies, and of course the fresh fruits and vegetables that come in season! To take advantage of fresh summer foods, I will be choosing a summer fruit or vegetable to discuss. Multiple recipes will be provided along with some background information on the nutritional benefits of that specific produce. If you try a recipe from my blog or even find your own way to incorporate the produce of the day into a meal, post it to Facebook, Instagram, or Twitter and tag me in it also add #produceoftheday to your post!